In the book Genesis, it was said that there was once a flood so great that it overwhelmed the entire world. This flood was known as the Global Flood, and all people died from the flood besides a few people chosen by God. Those chosen few were supposed “not wicked” in their hearts and didn’t deserve to die like the rest of the world did. Although many people believe that the story is just a myth, there have been hints that support the legitimacy of the story. Without further ado, here are five clues that a Great Global Flood actually happened. The first clue that a Global Flood happened is the fact that many, many cultures around the world have had flood stories that occurred in similar time periods. Such ubiquitous presence of flood legends across the world can’t just be a mere coincidence. Efficient communication tools existed back then, so how did they all come up with the story of a great flood? From Mesopotamia to Nigeria to China, these flood stories and legends are in almost every culture imaginable. Although nowadays, these are thought to be mere myths, we have to understand that people back then could not share information as fast and easily as we can today. Most of the time stories were how people passed down information about events that occurred. So maybe there are myths and legends about a great flood from all around the world because people all around the world did, in fact, witness a great flood. Like in many other civilizations, ancient texts say that the Chinese civilization began due to a great flood. Recently, archaeologists have found evidence of a great flooding of the yellow river that provides clues about the Xia dynasty, which is the almost mythical first dynasty of China. 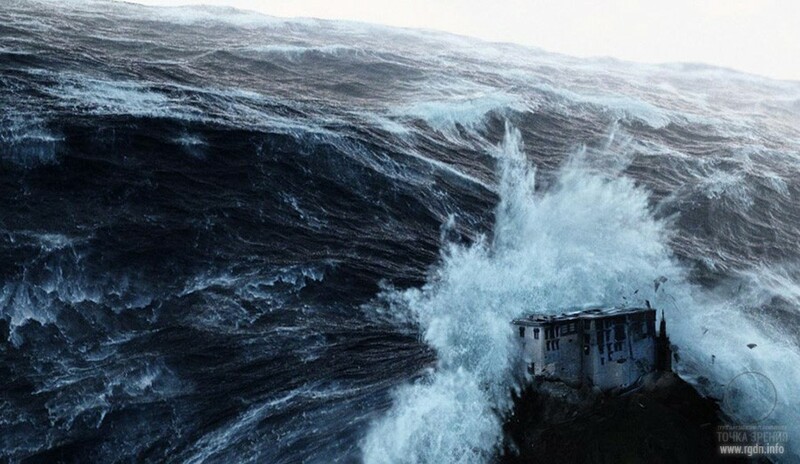 Legends say there was a flood that had waves as tall as a 30 story building and crushed anything in its path, even toppling mountains and seemed like it would never stop. Lands in China was submerged in water, and it was because of the efforts of Da Yu or Yu the Great, who gathered the people to dig tunnels channeling the water back to its source, thus becoming the ruler of the Xia Dynasty. Of course, this 4,000-year-old story was believed to be only a myth to some, but recently researchers say, it may not have been a myth at all. After observing the Yellow River’s Jishi Gorge area, geologists stated that there was an ancient landslide that created a dam about 660 feet tall. The dam blocked the river and as a result, created a lake that rose high above present river levels. Months later, when the water broke the dam, it created a massive flood that destroyed everything in its path. Sediments were found by researchers that gave evidence to a flood that rose as high as 50 meters above river levels. Precise dating later revealed that the approximate date for the flood would have been 1920 BC. So It’s possible that the Global Flood occurred at that time, and China was heavily affected by it. The third clue comes from a study by the National Oceanic and Atmospheric Administration (NOAA). The NOAA has recently documented evidence that water levels rose dramatically around 12,000 years ago, which would supposedly rewrite the entire geological history. After looking at satellite images, evidence has been found of water recession during the past 12,000 years. During the same time, there was also a major pole shift that explains the displacement of the icebergs during the end of the last Ice Age. This shows that there could have been a great flood that happened thousands of years ago that was caused by a pole shift due to changes in the magnetic resonance of the Earth. The water from the melting glaciers began to rush toward the world's oceans, causing floods all around the world. There are many massive underwater structures and sunken discovered all around the world. For example, a city was found off the coast of West India in the Gulf of Cambay. The city was found to be 10,000 years old and was completely submerged under 130 ft of water. Fishermen in the area had previously claimed that there were stories passed on from generation to generation of an underwater city in the area, but no one believed them or cared to investigate. It was only until the pollution survey test was made by India’s National Institute of Ocean Technology that scientists found huge structures at the bottom of the ocean in that area.The structures that were retrieved were carbon dated to be around 10,000 years old. Like I mentioned underwater cities like this one are found all around the world researchers even discovered wheel tracks such as the ones in Maltese archipelago where the tracks look like they deliberately plunge off cliffs or up and down very steep ridges, and some even drive off the island and into the sea, continuing underwater. It is not yet known who made the tracks, or why. This is something that started out as a theory by two Columbia University researchers. According to them, there really was a “Mother of Floods” that occurred in the Black Sea region. They said that the Black Sea was once a freshwater lake surrounded by land until it was flooded. The force of the water was monumental and swept everything in its path. To investigate the validity of the theory, Robert Ballard, who is well known for discovering the Titanic, decided to look for remnants of the flood. 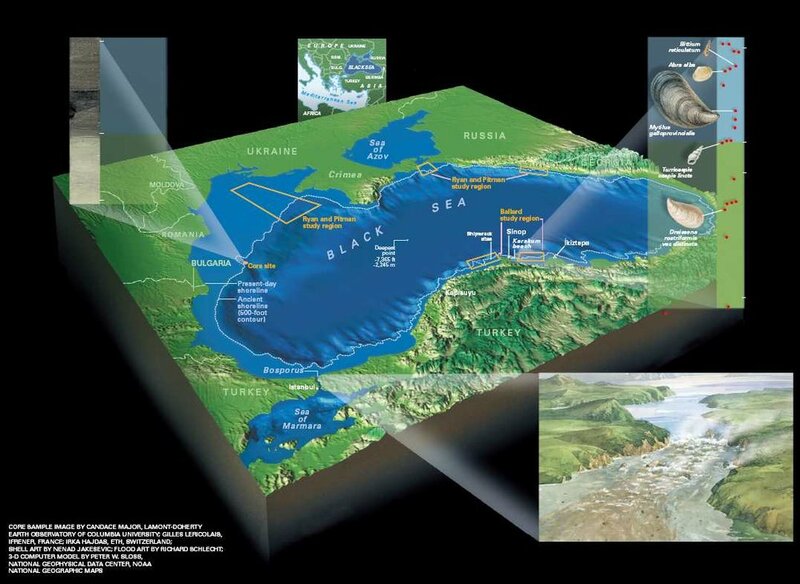 400 ft below the surface of the Black Sea, Ballard and his team found an ancient shoreline, which proved that something did happen in the Black Sea. After carbon dating shells that were on the shoreline, Ballard said that whatever happened in the area occurred around 5,000 BC which is believed by experts to be the time when Noah’s flood suppose to have occurred. What do you think? Did a Great Global Flood really exist that destroyed almost all of the world? Or were there separate floods in certain civilizations that coincidentally occurred during the same period?